Public-private partnerships, or P3s, have been repeatedly held up as a way for New York and other states to replace crumbling infrastructure despite enormous budget deficits. The Port Authority recent announced that it will use a P3 to finance the new Goethals Bridge, an important development that’s sure to be closely watched by the state’s transportation officials. The Port Authority will be paying a premium to get a new Goethals sooner, which will in turn save the agency from spending large sums to maintain the old bridge. It’s a Plan B made necessary by the authority’s inability to use traditional financing methods immediately. It’s not a source of free money or huge efficiencies. Under a public-private partnership, a private company would design and build the new Goethals and maintain it for a set period of time. The Port Authority wouldn’t put up any money up front, but instead would pay back the company a bit each year. 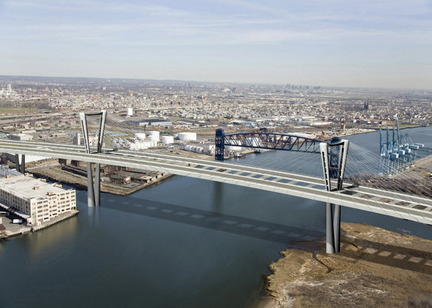 The Port Authority would still own the bridge and have the ability to set tolls. According to agency spokesman Steve Coleman, the Port Authority received eight proposals when it put out a request for qualifications last year. Now it is working to whittle those eight down to four finalists and will ask them for formal proposals later this year. In terms of financing, said Coleman, there isn’t a major difference between this particular P3 approach and traditional bonds. In both cases, the Port Authority would get a capital infusion up front and pay it off, with interest, over decades. The problem is that the recession has battered the Port Authority’s revenues, which determine how much it can borrow on the bond market. “Our capacity for bonding or capacity for doing capital projects has been reduced by $5 billion over ten years” said Coleman. Given current revenues, the Port Authority wouldn’t be able to issue the bonds for a new Goethals for some time. Under a P3, said Coleman, “the advantage is you get a new bridge built now.” It’s a safe assumption that revenues will come back when the economy eventually improves, he explained, and a P3 allows the Port Authority to use that expected income to finance the bridge immediately. With bonds, the Port Authority would have to wait until that revenue was at hand. Of course, the private sector won’t offer that service for free. “It’ll cost more,” said Coleman. “There’s no doubt that we’ll pay a premium.” In a recent AP story, Port Authority Executive Director Chris Ward estimated that using a P3 could increase the price tag of building the new Goethals by $30 million to $100 million. That premium might be worth paying, however. Every year that the Goethals isn’t replaced, it needs more and more expensive repairs. Depending on how much those repairs would cost and how much a P3 accelerates the project, it could be the case that the Port Authority can’t afford not to pay an extra $100 million for the financing. There’s also the issue of the cost of construction and maintenance. Coleman wouldn’t say whether he thought that construction and upkeep costs would be lower or higher under a P3 until bids came in. At that point, though, we will find out whether the private sector thinks it can find savings in infrastructure construction and maintenance compared to publicly overseen projects. Coleman did note that the Port Authority will be signing a contract to pay a fixed sum; if the project comes in over budget, the private firm will have to pay for the overrun. The details of the Goethals plan raise real questions about the ability of public-private partnerships to fix New York’s transportation infrastructure crisis. This deal allows the Port Authority to pay right away for a bridge that it expects to be able to afford later on, once revenues return to more typical levels. In contrast, the New York State DOT is currently facing enormous deficits that don’t seem likely to disappear on their own. If there isn’t the ability to pay for, say, a new Tappan Zee Bridge at a future date, a P3 along the Goethals model can’t conjure it up. The math of faster projects for pricier financing may make sense on some projects, but this P3 model won’t balance the state’s transportation budget. I’ve heard of some of these plans. In France, a private company built a double decked under-ground highway beneath Paris. Turning a 45 minute commute into a 10 minute trip. In California a private company added 2 new toll lanes to highway 91. Drivers have the freedom to use them or not. If they do they don’t stop at toll collection booths which slows things down and adds to congestion. Tolls are collected using sensors, EZ pass style devices stuck to your windshield. Others simply snap a picture of your license plate for every time you use the lanes and send you a bill every month. Uncongested roads actually move more vehicles per hour than congested roads, you just think the congested roads are fuller. And less congestion means less gas wasted and better fuel economy. And if you are stuck in traffic on these lanes, you’re entitled to refunds. These private companies footed the bill for nearly everything building the lanes, they have greater incentive to get you through traffic as fast as possible. The fewer vehicles they can pass through, the less money they make. Even if the toll is 75 cents or a few bucks. Competing companies may offer lower prices on their roads even though the road is a little longer.